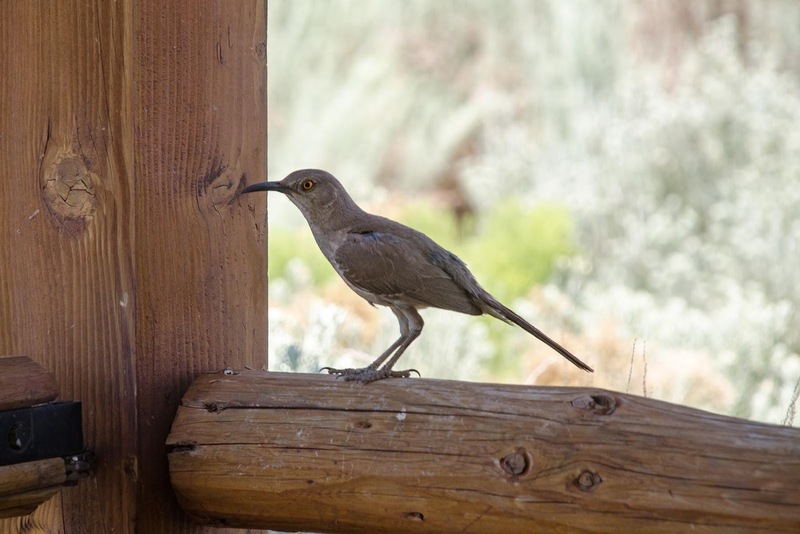 a Curve-Billed Thrasher was responsible. Me: Aren't you supposed to be sitting on those eggs? Mama Bird: Oh, give me a freakin' break. Papa Bird is taking his turn while I get some much needed shade. Me: Sorry...didn't mean to ruffle your feathers. 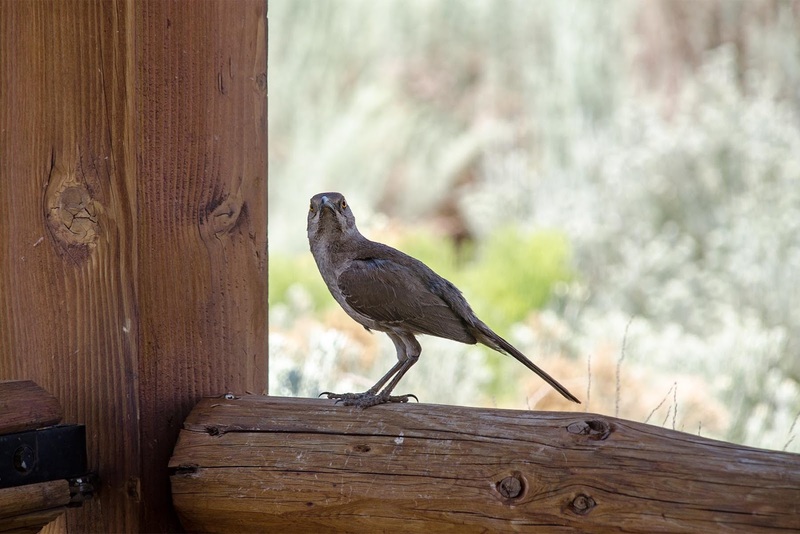 Cough*birdseed*cough What do Curve-billed Thrashers eat? Not like there is any danger of the eggs getting cold. Interesting bird. Hope it all goes well. That is a beautiful bird! Here in Upstate New York, we have Brown Thrashers, and they are absolutely beautiful singers. Hope all goes well with your bird family. We have a small wren nest in an dryer pipe that we put on our side porch. Gosh what a lovely bird. I am surrounded by black birds. Finally, the parents and babies have successful moved out of my shed roof-line-cubby hole-thingy. I don't even know how they built the nest. It felt like ages before their little babies left the nest. What a beautiful bird, I love her beak. Better warn her about the resident feral feline. I've seen pictures of him perched on that rail. When I had my garden a thrasher would come through daily and flick tender seedlings out of the ground daily despite my efforts to thwart him. One time I caught it on the fence ready to swoop down. We had a staring contest and it finally flew off. I called him (or her) Jerkwad. Although that is cool that she built a nest in the cactus. I suppose they are interesting to watch as long as they aren't ruining a garden. Wow. 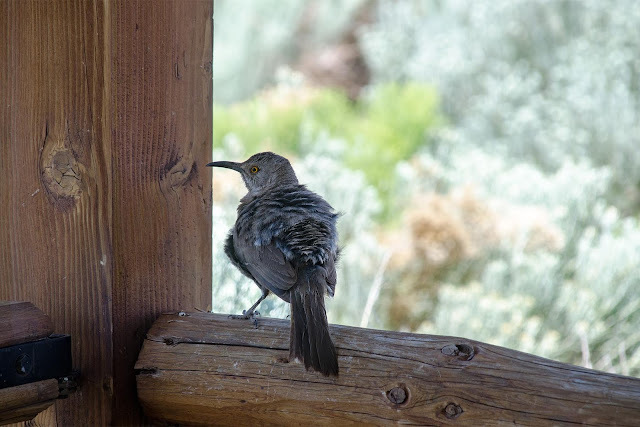 So maybe the nest in my cholla is really a thrasher? I've seen cactus wrens in it but i will have to watch more closely. 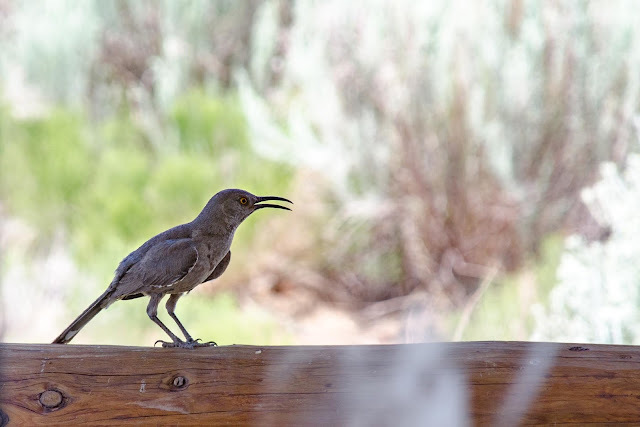 I've never seen a thrasher around here but I hope there is.